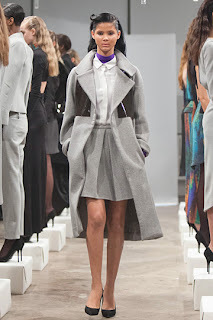 Lady-like gray pleats and nods to demure Hollywood-glam silhouettes licked the 90’s rave kid lollipop at Daniella Kallmeyer’s F/W ’12 presentation. Kallmeyer reinvented classic black and gray skirts by pairing them with black vinyl and pops of midnight navy and neon violet. Tangerine turtlenecks and pleather collars brought an edge to tame, tucked in button-downs and white sweaters. Black on black in fur, vinyl, and shiny patent leather added an androgynous layer to the collection that Kallmeyer described as being “very inspired by raver culture and ‘90s TV shows.” The textures and bright colors emulating peacock feathers added dimension to the demure cuts, living up to the collection’s "Grandma's at a Rave" title. I might be alone on this... but, as a child of the ‘90s, this collection fulfilled a sort of dream of mine. The boyish pieces that still seamlessly evoked femininity when paired with tie-dyed purple, green, and orange reminded me of one very memorable character from ‘90s TV. The straight blue leggings with green polka dots paired with a prim purple dress… Angelica from “Rugrats.” Kallmeyer’s collection would have been Angelica’s dream closet – and really, Angelica would have been a whole lot cooler with a black vinyl backpack with fur straps.